Our collection of Khalil Mack Fantasy Football Names will give you plenty of options if you draft this dynamic defender for the Bears. The Oakland Raiders drafted Mack 5th overall in the draft. At Buffalo (for college), Mack set the NCAA record for forced fumbles. Mack was the first player in NFL history to be selected first-team All-Pro in two different positions in the same year, as a defensive end and outside linebacker. Despite his star qualities, the Raiders traded him to the Chicago Bears. 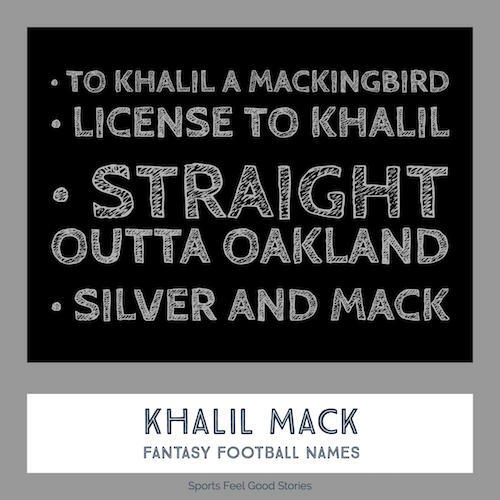 Check out these fantasy football team names focused on Khalil Mac. What is Mack’s favorite Movie? Well, believe it or not, it’s Mary Poppins. Mack plays the guitar – he taught himself as a freshman at college – and enjoys writing music and singing. Tim McGraw and John Mayer are a couple of his favorite performers. His music roots may go back to his childhood days and his father’s role as a deacon at their church. Mack’s preferred sport in high school was basketball. But, an injury and a persuasive football coach convinced him to give football a try. The coach made the case that at 6’3″ and 251 pounds, he was too big not to give football a try. Having only played his senior year, his only scholarship offer was from Buffalo. Needless to say, Mack made the most of the opportunity. Mack grew up in Florida, the middle of three sons.